Q: Is the Freedom360 waterproof, or can you make it waterproof? A: No, the Freedom360 is not waterproof. The Gopro Hero3 is a little bit weather proof, and will most likely survive a couple of drops of water or rain. Saltwater makes things worse, in general. The flexible plastic port cover on the right side of the camera can be inserted and removed leaving the cameras installed, although it may not be the easiest task. The ThinkTank pouch with the build-in rain cover offers great protection, even while leaving the Freedom360 on a pole. Another aspect is the heat generated by the cameras: the bag helps retaining the heat when shooting in cold conditions, and elongating the battery life. Q: Why don’t you use the acrylic, waterproof cases for the cameras? 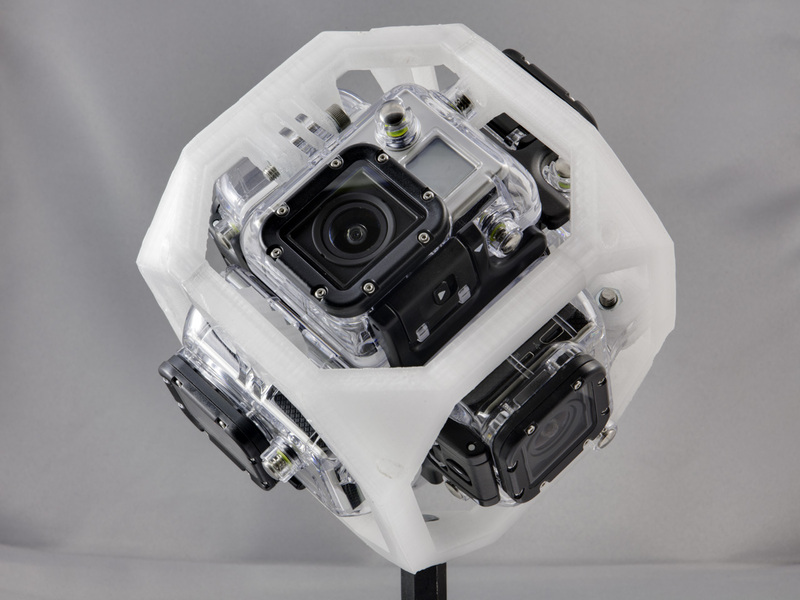 A: The biggest advantage of the Freedom360 rig is the compact size and weight, a bit over 500gr for the full unit. Using the acrylic cases adds about 700gr to the rig, pushing the total weight over 1200gr, giving it a very unwieldy handling and feel to it, plus the supporting pole needs to be much stronger. Another side effect is the inherently larger parallax error during the stitching process, making close-up panoramas (i.e. surf board) more difficult. Q: When are you bringing a waterproof version to the market? A: We have a prototype for the Freedom360 Explorer, a frame based design that adds multiple holding points to the individual acrylic cases, as well as adding external protection against bumps. It requires some more tweaks and design refinements before it is ready for the market. The Freedom360 Explorer is strictly for shoots above water. Q: Can I go diving with the rig? A: No, The Freedom360 Explorer is not suitable for diving, despite the fact that the acrylic cases are made for diving. We are working on a modified version specifically for diving, called the Freedom360 Submariner, based on the design of the Freedom360 Explorer, but with modified lenses, as well as some other modifications for underwater usage. We are hopeful to make more announcements in June 2013.